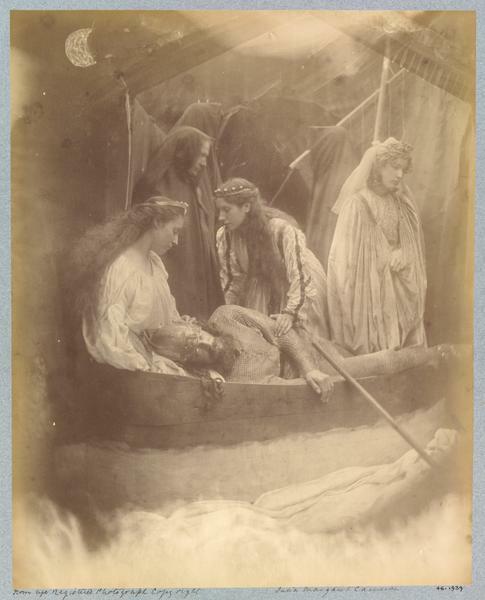 In 1874, Alfred Tennyson, the Poet Laureate, invited Julia Margaret Cameron to make photographic illustrations to his Idylls of the King. This was a series of narrative poems based on the legends of King Arthur. After her large photographs were published as small, wood-cut copies, Cameron decided to produce an edition illustrated by original photographic prints. She accompanied these with extracts from the poems written in her own hand and printed in facsimile. She claimed to have made as many as 245 exposures to arrive at the 25 she finally published in two volumes. This is by far the most theatrical of Cameron’s illustrations to the Idylls. The wounded King Arthur is taken by boat from Camelot. Cameron used fabric to create the illusion of waves and mist, and even drew a moon on the negative in the upper left corner. 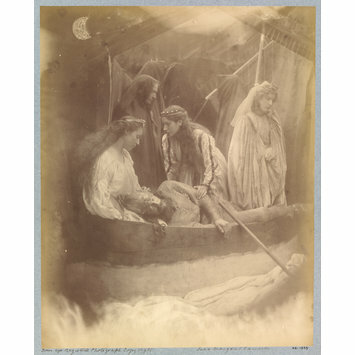 A photograph of a group of people (Mary Hillier, William Warder, Mrs. Hardinge and unknown woman) in a boat. Warder is laying down while two of the woman are leaning over him. The third woman is standing in a cloak looking downward. Hooded figures stand in the background. "From Life Registered Photograph Copy Right" in ink lower left verso of mount. "The Passing of Arthur" in ink bottom centre verso of mount. "Julia Margaret Cameron" in ink bottom right verso of mount. Blindstamp: "VICTORIA AND ALBERT MUSEUM LIBRARY" top centre verso of mount. Ford, Colin and Cox, Julian. Julia Margaret Cameron: The Complete Photographs. London: Thames and Hudson, 2003. Cat. no. 1193, p.480, ill.
Gernsheim, Helmut. 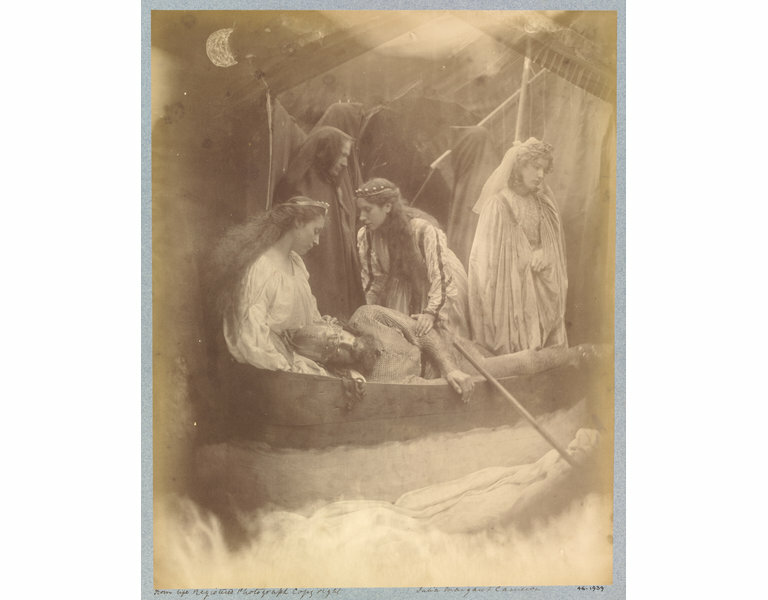 Julia Margaret Cameron: Her Life and Photographic Work. Millerton, N.Y.: Aperture, 1975, p. 81. Lukitsh, Joanne. Cameron: Her Work and Career. Rochester, N.Y.: International Museum of Photography at George Eastman House, 1986, p.37. Hopkinson, Amanda. Julia Margaret Cameron. London: Virago Press, 1986, p. 155. Lukitsh, Joanne. Julia Margaret Cameron. London: Phaidon Press, 2001, p. 119. Weiss, Marta. Julia Margaret Cameron: Photographs to electrify you with delight and startle the world. London: MACK, 2015, p. 123. In this episode from Tennyson’s Idylls of the King, the wounded King Arthur is taken by boat from Camelot. Cameron employed more stagecraft than usual, creating the illusion of waves and mist out of fabric, and even drawing a moon on the negative in the upper left corner. Originally part of a bound folio volume containing 13 photographs by Cameron (one of two albums of illustrations to Tennyson's 'Idylls of the King and other Poems' published by Henry S. King & Co., 1874-75). Each photograph is mounted on bluish mounts with gilt borders.